I like to be green: saving energy, growing food, cutting down on water use, all the things that crop up throughout this blog. But from a different perspective, much of what I write could be about saving money: repairing rather than replacing, minimising fuel bills, buying packets of seeds rather than baskets of vegetables from the supermarket, and so on. Whilst some aspects of our life have required quite large financial investments (having solar pv panels fitted, for example) many of the changes we have made have required relatively little, on no, money and have saved on outgoings (for example filling the toilet cistern with rainwater rather than metered mains water). We throw away 7.2 million tonnes of food and drink from our homes every year, costing us £12bn – most of this could have been eaten. They say that this equates to every person in the UK throwing away, on average, 120kg of food every year. Yes, you read that right 120kg per year! I know that I don’t throw away anywhere near that, so someone is chucking out considerably more! Actually, none of our uneaten food goes to waste here; one way or another it gets used: fed to the dogs, chickens, wild birds, worms or compost bin. So even if we don’t eat everything directly, some of it comes back round in the form of home-produced fruit, veg or eggs. And because we are not self-sufficient and have to buy lots of our food, the net result must be that the ‘waste’ should be considered a resource that increases the fertility of our land. Most of what goes to the garden one way or another is not food that could have been eaten, it’s usually peelings, pods, tops, outer leaves etc. When we do have left-over food, we either eat it the next day or put it in the freezer for later use. I try, also, to use every scrap of food when cooking. Thus chicken carcasses are picked clean and then boiled up to make stock for use in soups, sauces, risotto, casseroles and so on. When collecting food from the garden, it’s often possible just to collect what you need, so there isn’t any waste at all. For example, cut-and-come-again lettuces allow you to pick as many leaves as you need and leave the rest of the plant growing. This also means that you get fresh leaves every time, not some that have been sitting in a plastic bag for a week. Of course, in good years, there are gluts in the garden and then preservation is necessary. But even simple measures, like sealing left-overs in a bag or container before putting them in the fridge can allow you to enjoy them a couple of days later without a risk to your health. However, I still like to get the absolute maximum out of the things that we do buy: I can’t bear leaving any of a product behind in the packaging. 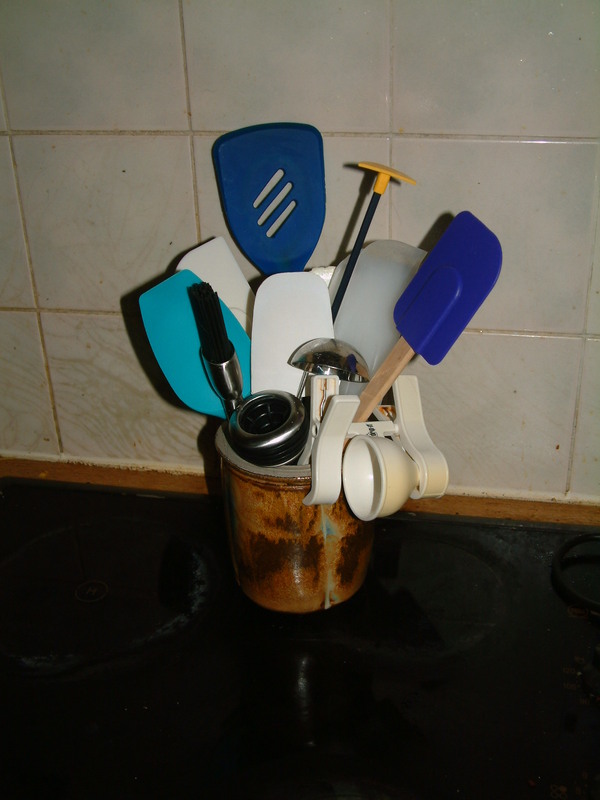 As a result I have an impressive array of jar-scrapers, brushes and scoops… if I’ve bought something (or even been given it), I am going to use every last scrap of it that I can! I also have a couple of special funnels designed so that one bottle can be held over another to allow every drop of liquid to be transferred to the new receptacle without standing around holding the bottles for an hour or so. I use these for all sorts of liquid, but oils in particular. I also cut open plastic tubes, so that I can access whatever has stuck to the side. This applies equally to food or cosmetics. 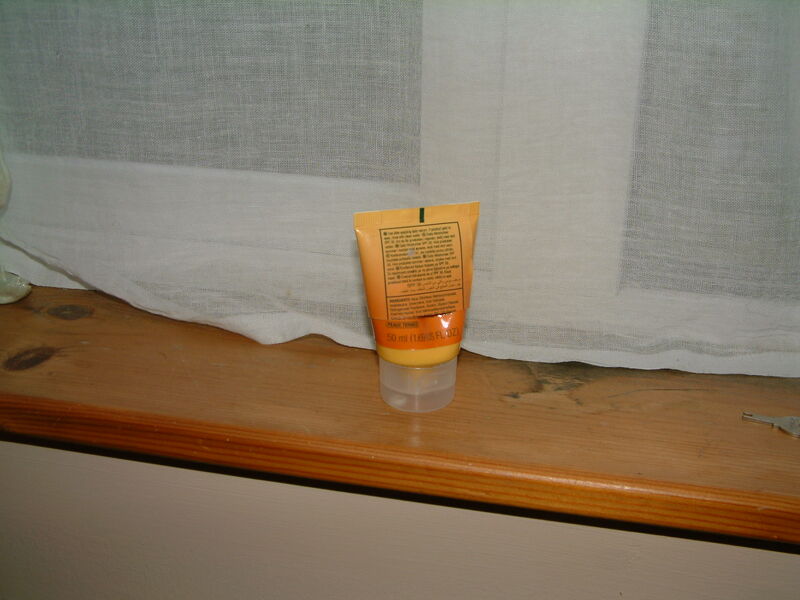 About three weeks ago I apparently came to the end of a tube of moisturiser. When I cut it open I discovered that about 1/3 of the total original volume was adhered to the inside of the tube and could not be squeezed out in the conventional way, but could be accessed easily after judicious application of scissors. Call me cynical, but I can’t help feeling that the manufacturers would be quite happy for me to simply buy a new tube once no more moisturiser could be accessed through the nozzle. I guess that I’m not a good consumer from the perspective of manufacturers, even if I am a wonderful consumer from the perspective of the planet. But I know which I’d rather be! Had to laugh at you cutting the end off a tube of moisturizer. I do that too. That stuff is expensive, and I’m always amazed at what is left in the tube. I put a small plastic bag over it once cut to keep it from drying out. I seem to be turning into my mother, who always does this sort of thing. But, like you say, it’s expensive stuff. Actually I’m pretty sure that I should be using cold cream, but I’m seduced by the smell! Just came across your blog through Paul Glynn and absolutely loving it. Sadly I don’t have a garden at the moment so growing my own food isn’t really an option but great to get some tips on how to make more of what I do buy. Definitely going to be cutting open all my cosmetics when they’re ‘finished’ now! And looking forward to reading back through your archives – am sure there’s lots of interesting stuff to discover. Thanks for visiting. Even without a garden you can still do a bit of cultivation: making bread and yoghurt, for example. And most people have room for a pot of basil or parsley on the windowsill, or even a pepper plant. I somehow feel there should be a more efficient way of exploring my blog (for me as well as you, since I can’t always remember what I have written about! ), but I have yet to think of one. Brilliant idea to have window boxes… good luck with them! Great points – it’s amazing how many people overlook thinking green even when it could be saving them money! I had forgotten about cutting up tubes to get the last out of them, will keep that one in mind. You’re quite right, manufacturers would much rather just sell more more more! Strange, isn’t it? I have been toying with the idea of running a workshop on ‘green money-saving’… but maybe no one would pay to come!! Though our family has gotten better about never wasting food (leftovers get eaten later or sent to the chickens or worms) I still feel like we have too many things that end up in the trashcan. Much of it is packaging that can’t be recycled or reused. I know I should make my own yogurt in reusable containers instead of tossing those little plastic dishes into the trash but I just haven’t found the motivation yet. I think money can be a great incentive… I often make my own yoghurt and an surprised how cheap it is, even when I buy organic milk. However, sometimes the problem is being sufficiently organised and that’s when I get lazy and go out and buy the stuff! Great post. I am also all about reducing garbage. Your tips all seemed very normal to me, wish everyone used them! I also am shocked by how much food is thrown away every year, not to mention all of the packaging that is used once, then pitched out. Keep up the good work. I’ve been planning to write about this for a while, but hadn’t because it seemed a bit mundane… stuff that is just part of life. However, it seems to resonate for a lot of people – so, everyone, keep up the good work!